The image was captured downtown Seattle Wa on a cold and rainy night. Our bride wanted some night pictures and we were more than happy to go out and have some fun with her and her new husband. Unique Moments Photography from Gig Harbor always brings umbrellas and we are prepared to use the rain in Seattle as an advantage for the image capture process. We just love how the rain shows in the images and how all the awesome night time lights reflects on the wet pavement. It is Imagery that not everyone gets to have in their wedding image selections. So brides and grooms, Dont sweat the rain. Its a good thing because your wedding images will look like this. 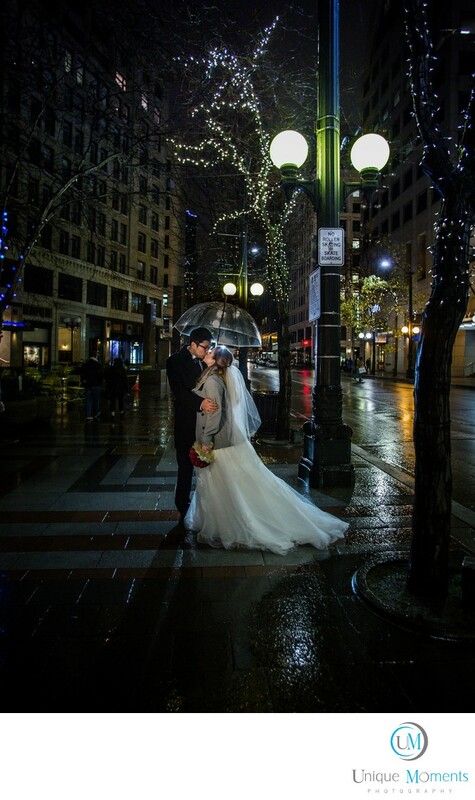 We have a few examples of rain shots up in the wedding gallery. We want your images to be spectacular and rain shots are an advantage to the photo capture process.